Warning! This is a work in progress. You will likely destroy your Didj. I'm not responsible for any damages, claims or injuries that may result from this write up and files. If you don't know what you are doing just leave the Didj as it is. Some notes about the availability of the cartridges. Build a DIDJ to xD Card Adapter. Linux reads the correct Flash ID from the xD Card. Dumped the xD Card thing, got the SD-Card controller partially working in u-boot. Lightning-boot loads u-boot from the internal NAND Flash. 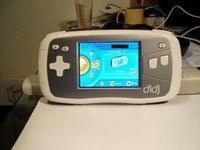 I was impressed about the size of the Didj , really big for a children's toy. The screen is also big compared to other toys (OnStation,those 20€ Sega Handhelds,..). Thanks to elinux.org that the pins for the console are known. I soldered a 3.3V RS232 level shifter on these pins. Poking around in the filesystem I found some interesting test tools in the /usr/bin directory. Time to do some serious hacking! 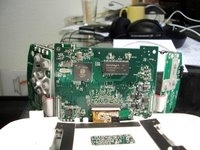 Leapfrog published the source code of the linux kernel , uboot (which isn't used in the release version of the Didj) and a custom bootloader called "lightning-boot". I figured two ways out to boot the Didj from external sources. The processor (Magic Eyes Pollux , or some kind of custom derivate for Leapfrog called LF1000) has the ability to boot over the UART. 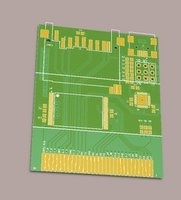 An other nice feature is the possibility to swap the NAND chip select lines with those on the cartridge connector. 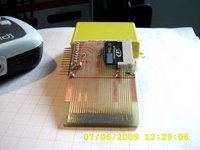 This features are controlled by pull up / down resistors on the cartridge slot . For example if you want to use the UART boot feature you have to pull D5 and D6 down (I used some 470 Ohm resistors). The next time you power up the Didj it seems as it won't start , but the processor is full functional an waits for some input on the UART. The resulting binary was around 8kbyte large , I filled the file with 0xff's until it grow to 16kbyte and transferred it to the Didj. Woot! My own build bootloader boots!!! But a minor bug is there , I had to hold the power button slider. It seems my bootloader doesn't initialize some GPIOs the right way. You have to install the pull down resistors mentioned above. Afterwards, if you remove these pull down resistors, the Didj starts normal from NAND. In the next days I'm trying to build my own NAND cartridge , at the moment I'm waiting for my Digikey order containing some NANDs and a STM32. My plan is to use the STM32 as a USB to NAND interface , so I can easily put files on my custom cartridge. 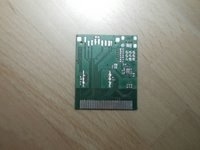 On the cartridge there is the same type of NAND as soldered inside the DIDJ (MT29F2G08AADWP , 256MB). 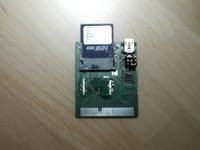 This NAND chip is connected on the DIDJs expansion connector and to a STM32 (STM32F103VET6 , 512K Flash) on the cartridge. The purpose of the STM32 is to boot the DIDJ with my custom bootloader which the STM32 transfers to the DIDJ on powerup over the UART. The second purpose of the STM32 is a USB interface to the NAND chip (raw , no fs!) on the cartridge. And at last the STM32 converts the DIDJs UART to a USB CDC class. Further I rebuild the cross-compiler. On the first try I build a OABI compiler but the DIDJs rootfs/kernel was build with EABI. vo_brio and vo_brioyuv plugins won't work as expected. After fixing some paths in the vo_brio source files I got some garbage on the LCD. Maybe Leapfrog changed the mlc driver in the release version ? So it's time to get my own kernel running on the DIDJ. 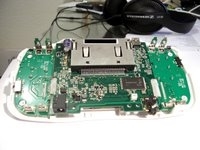 the Didj's bootloader. The image is displayed on the TFT. There is a bug in the x-modem code, EOT doesn't work. ............... done, booting the kernel. LF1000 Real Time Clock driver. UBI: MTD device name: "Brio"
UBI error: attach_mtd_dev: incorrect MTD device: "prg_Brio"
UBI error: ubi_init: Failed to find MTD device prg_Brio. Skipping. UBI error: attach_mtd_dev: incorrect MTD device: "Cartridge"
UBI error: ubi_init: Failed to find MTD device Cartridge. Skipping. UBI error: ubi_init: Failed to find MTD device EXT. Skipping. UBI error: attach_mtd_dev: incorrect MTD device: "prg_EXT"
UBI error: ubi_init: Failed to find MTD device prg_EXT. Skipping. Starting Application and Power Monitor daemon. The hardest part was fixing u-boot to compile with any of my toolchains. At last I got it working with my crosstool-ng EABI toolchain (with a lot of hackery...). Sourcecode will follow shortly ! Transfer lightning-boot.bin to the DIDJ (19200 baud , as binary) while holding any of the buttons. As soon as lightning-boot starts release the button and switch the terminal program to 115200 baud. Start xmodem transfer of u-boot.bin in terminal program and press any button on the DIDJ to start. Ohhh and I think I have found some testpoints for the USB Host and TV-Out ,wich the LF1000/Pollux has build in. Linux recognizes my xD Card (Read the manufacture ID) but I can't get linux-mtd use it. My xD card is a 2 GByte type which uses MLC NAND Flash and I can't get an datasheet for any type of MLC NAND -> so no Linux driver for it :-( . So I ordered some 512MB xD Cards (or non "Type M" Cards) , they are based on SLC NAND and should work like any other NAND Chip. Since it is really difficult to get those non - "Type M" xD-Cards these days , I dumped the xD-Card cartridge idea and go for a simple SD-Card cartridge without any controller or other fancy stuff on it ( except for a FTDI USB/RS232 converter for console access) . Further , as mentioned above, I did some stuff with lightning-boot. Lightning-boot now has LCD Text output and some simple drawing functions ( setpixel , clear screen). Lightning-boot loads u-boot from the internal NAND flash, I added u-boot to the kernel partition ( which has a obscure "filesystem" , called TFS but luckily in the leapfrog tarball there is a python script to generate a flashable TFS image). After this steps everybody should easily can start homebrew on the Didj , only 3 things are needed : The SD-Card cartdridge, USB Cable and a computer with a recent Linux installed. Just drop me a email if you need a cartdridge. I ordered 10 Didj cartridge PCBs. The PCBs will arrive on October the 8th. As soon I populated,soldered and tested the cartridges I will ship them. 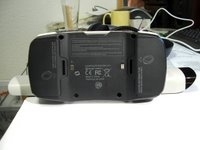 The cartridges will have an FTDI FT232RL for console access and an SD Card socket. 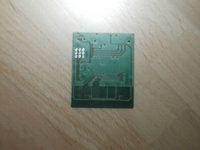 Further ther is an unpopulated Footprint for a NAND Flash. 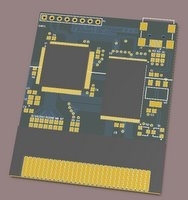 I will release the Altium Designer project , Gerber files and BOM as soon the first batch of PCBs is populated and I'm sure that there are no errors in the layout. Feel free to join :-) Any kind of help is welcome ! In the future I will shift this page to the Berlios Opendidj Wiki. The Cartridge PCBs arrived yesterday. I build one prototype and it works! Don't worry the Cartridges I will ship look far better. They will be soldered in a reflow oven. Next week I will have next to no spare time, so I will populate and solder the cartridges next weekend. Finally finished the cartridges , sorry to everyone who orderd for the delay! All cartridges are sold ! I get many request if I ever build a second batch of the Cartridges. build the Cartridges for me. But the Cartridges definitely get more expensive If i build them by myself. I will let you know when I get an offer from the manufacturer. Updated 12.02.10 Contact : claude dot schwarz aet gmail dot com , please put "DIDJ" in the subject line!